Easy Cornbread – this is the BEST homemade cornbread and it is super easy to make! 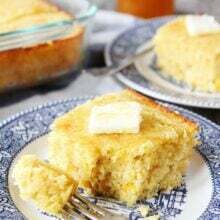 This cornbread from scratch goes with any meal and is so delicious topped with butter and drizzled with honey! So I made Josh a pan of Easy Cornbread, from scratch, and asked him if he still wanted to eat boxed cornbread. He devoured his first piece and was already eating a second, so I knew my answer. He loved my homemade cornbread recipe! What Does Cornbread Taste Like? There are several variations of cornbread out there. Some like it on the sweeter side, some like it dense, some like it light and fluffy, and some like it with corn. In my opinion, this is the BEST cornbread recipe. It is a little sweet, but not over the top. It is also light and fluffy, but still has really good texture. It isn’t too dense, but holds together nicely. It also has corn kernels stirred in, but if you don’t like corn in your cornbread, you can easily leave it out. This Easy Cornbread recipe is now a staple in our house. We make it all of the time. It goes great with chili, soup, or salad! Sometimes we just make a pan of cornbread because we are craving cornbread. It is that good! We love topping a big piece of warm cornbread with butter and a drizzle of honey! The BEST! 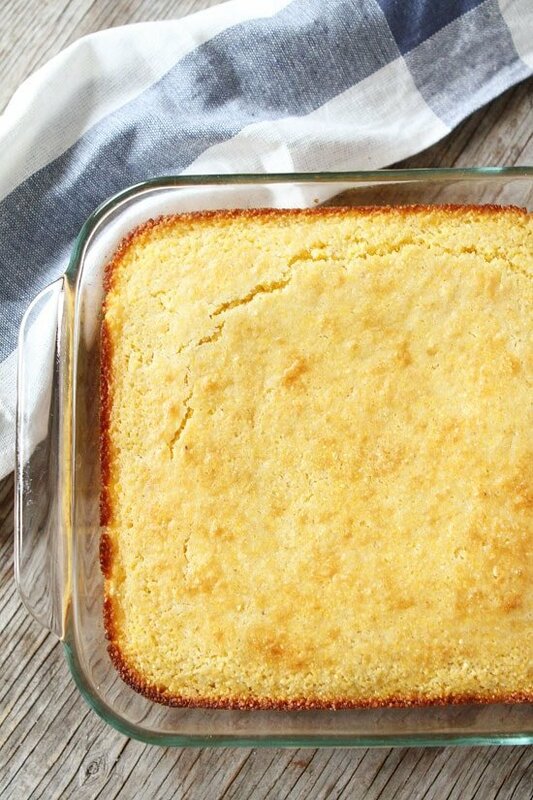 The next time you are craving cornbread, give my Easy Cornbread recipe a try. It is just as easy as the boxed stuff but SO much better! I guarantee it will be your go to cornbread recipe! A fun way to change this recipe is to place the batter in a muffin tin. Use this same batter and equally divide batter into a regular size muffin tin. Our boys love having their own individual muffin. Remember when you are cooking in a muffin form it will take less time so only cook for around 15-18 minutes and check with a toothpick. How Long Will Cornbread Keep? We often get asked if the batter can be made ahead of time and then baked off later, the easy answer to this is no. This Cornbread is easy and best if it is served fresh. This cornbread will last 3-5 days depending on your environment such as temperature and humidity. Cornbread is also a popular recipe at Thanksgiving and Christmas because cornbread is the perfect base to stuffing. Cornbread stuffing is a traditional holiday recipe and to make the best stuffing, you need to start with good homemade cornbread. This is a great recipe to make cornbread stuffing. You can make the cornbread the day before. Cut the cornbread into cubes to use for your stuffing recipe. 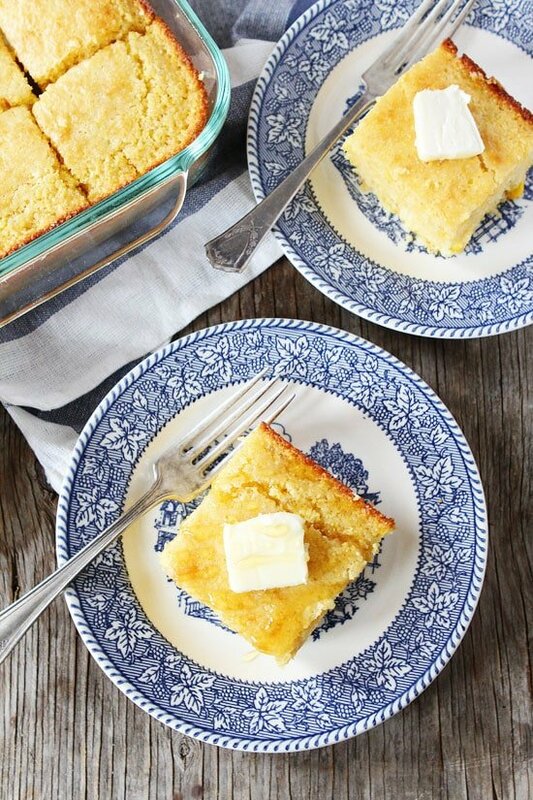 This is our all-time favorite cornbread recipe! It is so easy to make and good with any meal! Top with butter and a drizzle of honey and you will be in heaven! Center a rack in the oven and preheat the oven to 400°F. Spray an 8x8 Pyrex baking dish with nonstick cooking spray and set aside. In a large bowl, whisk together the flour, cornmeal, sugar, baking powder, baking soda, and salt. Set aside. In a medium bowl, whisk together the buttermilk, melted butter, oil, and eggs. Pour the liquid ingredients over the dry ingredients and stir until combined. The batter will be lumpy. Stir in the corn kernels. Pour batter into prepared pan. Bake cornbread for 27 minutes, or until the top is golden brown and a toothpick comes out clean after inserted into the center. Let cornbread cool in pan for 15 minutes before cutting. Cut into squares and serve. That story about Josh and the 20 boxes of cornbread is pretty funny ~ my husband can’t buy anything whatsoever in NON-BULK form. He buys everything from the dozen! Came home with 50 bags of cat litter the other day. Where does he think I can store this stuff? We only have 1 cat! 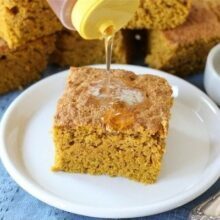 Anyhow, I’ve been looking for a goo cornbread recipe, this looks amazing. Definitely putting the butter on top. I literally JUST discovered the magical-ness that is cornbread last year! I grew up in Canada, and we didn’t eat it there. And now I am 100% obsessed with the stuff, so I am ALL over this! Pinning! Can I make this without the corn? I know hubby won’t like the texture. Yes! You can leave the corn out. It’s so hard to find a cornbread recipe that doesn’t give you the hiccups because it’s so dry. Your recipes are great, so I’m definitely going to try this cornbread! 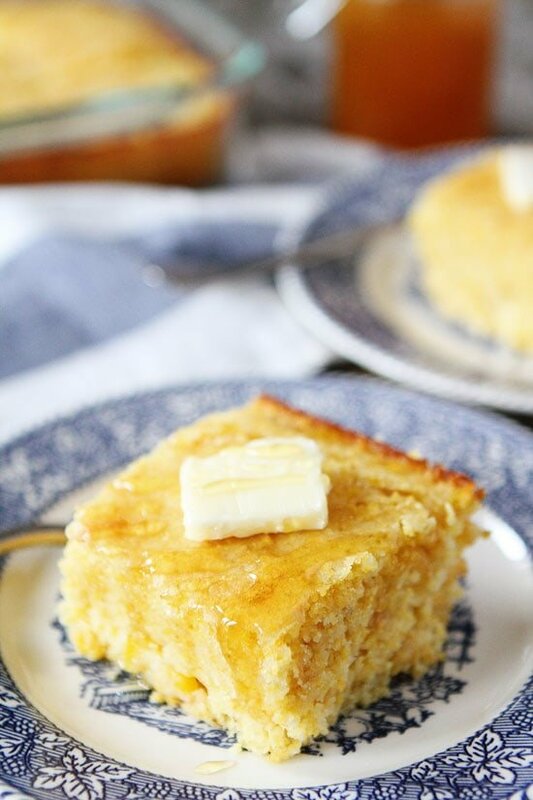 Fresh baked corn bread is so good topped with melting butter and honey! Yum! I TOTALLY buy the Jiffy Cornbread (shhhhhh…I stir in canned corn and shredded pepper jack cheese so no one knows!!) but now I’ve GOT to try this instead! Classic and delicious! Love a good cornbread! I have a soft spot for Jiffy cornbread too! but this looks much better and very delicious!! Can I add honey to this? Do I need to alter the recipe to add honey? If you want to add honey, I would omit the sugar. Use 1/3 cup honey instead. I haven’t tried it, so let me know how it turns out! What brand of oatmeal do you use? Thanks! I buy cornmeal from the bulk bins at Whole Foods or other stores. I buy the coarse cornmeal. Sorry I MEANt Cornmeal!! Not enough coffee..
I’m definitely guilty of buying the Jiffy cornbread boxes. I’ve never actually tried to make it on my own, shockingly. I think this is the inspiration I needed. It looks so easy too! Looks so good – that butter and honey – DROOL! I lave cornbread. Homemade is a must. This recipe is just how I like it, slightly sweet with whole corn kernels. I want to go home and make some now! I love a good cornbread it goes with so many things and just as good as a stand-alone treat. Looks amazing! What baking times would you recommended for mini and/or standard muffins? Probably 15-18 minutes for regular muffins, depending on your oven. Check them! For mini, try 12-15? This cornbread looks delicious! I can’t wait to try your recipe! Love that you put whole corn in yours! I think this makes it so much more yummy. I’m going to give your recipe a go! Any suggestions for cornbread muffin cook times? I would bake them at the same temperature, but for 15-18 minutes. Check them! Cornbread is a staple here, especially on busy days when we don’t have much time to make dinner! Oh yes, sign me up! You’re giving me all sorts of good ideas for the menu this week. I haven’t had corn bread in ages! I’m going to save this to make later. My husband did that with lemon cake mix……loves lemon cake! 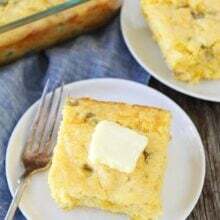 I love cornbread and enjoy trying new recipes for an old favorite. I prefer to use either medium or coarse grind cornmeal for the texture…kind of rustic. I have found the least expensive place to purchase cornmeal is in the Latin food section of the grocery store. There is usually a choice of grinds and sometimes I buy a variety and mix then together. Bob’s Red Mill also has a coarse grind product but it is not carried everywhere. We use coarse cornmeal too! Homemade cornbread is the best! HAD to try this last night after seeing the picture first thing yesterday morning, Maria, and it WAS A HIT! I omitted the corn, but otherwise the flavor was Yummy, and it was super easy! I did not have coarse corn meal, but good ole’ Aunt Jemima brand worked like a charm!! Quitting sugar. Is there a good substitute for the sugar in this one? Southern cornbread doesn’t have sugar. Just leave it out. We call this a Corn Brownie. Made this for dinner last night and my son declared it the BEST cornbread I’d ever made! Easy and delicious! This recipe is a keeper. Thanks Maria! I made this tonight. I did leave out the corn because I didn’t have any. I also added a little more sugar because I like it a little sweeter; this recipe is a keeper! Mine only baked about 18 minutes because I preheated my cast iron skillet in the oven before pouring in the batter. Maria, I love the cornbread, it’s really good! I love your dish pattern, can u tell me the name, pretty please. I just made the recipes and used a muffin pan – It made 12 muffins and I had a little mix left. 400 deg, convection bake setting, 12 minutes. Can I substitute regular milk for buttermilk? Thanks! I only use buttermilk, but you can try milk! I am sure it would be ok. You can also make buttermilk by adding lemon juice or vinegar to regular milk. I wondered the same thing. I just don’t use enough buttermilk to keep it on hand. I found out about making with vinegar about 6 months ago. Probably from twopeasandtheirpod! Love that you put the frozen corn in! Either people love the corn or hate the corn in their cornbread. I am a lover!!! This recipe looks delicious. Honey and butter is all you need! Mine turned out a bit too dry and crumbly. I have my ol standby that has sour cream added to it that I much prefer. This was the most amazing cornbread ever. And I’ve made good homemade cornbread before, but never as good as this. No need to look any further for THE cornbread recipe- this is it! I am so happy right now! I just made this for dinner and it is gone (I have a family of 5; I didn’t eat it all by myself????)! I love the Jiffy cornbread and have yet to find a homemade cornbread that is as good. But this is it! Thank you so much for posting. Just made it. A cool soup night here in OK . I was out of cornbread mix and really wanted some. It is so easy and delicious. Make you wanna’ slap yo mama as we say in the South. My husband said that this was the “best” cornbread that we have had in a while. Love it! This was the best cornbread I’ve made or have had! I loved the corn on the inside. Not too sweet, but had some sweetness, which my family likes (we are Jiffy fans). Love that I have a more wholesome version now. This is my second time making this cornbread and I can’t wait for it to come out of the oven! So easy and delicious. A must have for my recipe box!! This was excellent. much better than a boxed mix. 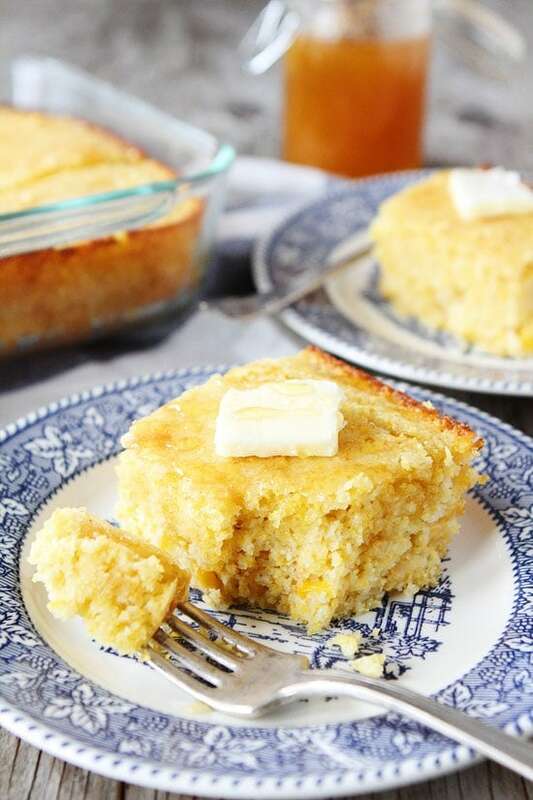 Hello Maria, my husband loves cornbread so I am definitely making this with our supper tonight!! I’m a new blogger, loving it so far. I’m just trying to connect with other professional bloggers to get some feedback on time management, products, quality of pictures and writing content, and just my whole blog. I would appreciate your feedback so much. Thanks! Best homemade cornbread I’ve ever made! I have tried many recipes. My family loved it! Thanks – I like to cook from scratch and this recipe will be used many times over. If I need to make a 9x 13 size, do you think I could just double this recipe? could you use regular corn or cream corn? IT LOOKS AWESOME, I WAS HOPING THAT I COULD REPLACE THE 2 EGGS DO YOU THINK IT WOULD TURN OUT OK?? Can you leave out the whole corn? I have some texture issues with children:( ? I am a jiffy fan also, but will be making this recipe soon. I also love cornbread in my dressing but half of the family does not like the corn bread in it at all. So I make the dressing without the corn bread. place half of it in a casserole dish and bake it In the oven. Add some warm chicken or turkey stock to remaining stuffing, break cornbread into pieces and mix together with stock and dressing. Place into greased casserole dish and bake. 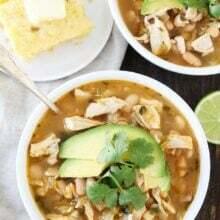 Use a can of Campbell’s Cream of Chicken Soup and half a can of water or milk to cook and make a warm sauce/gravy for top of a piece of corn bread. I make this for myself when I have a longing for a turkey , dressing and gravy meal. I do open a can of whole Cranberry Sauce to go with it. My cousin fixed it for her grade school grand kids for lunch one day during a week one summer vacation with her. They asked for it 3 more times during that week. This is the first time I have added a comment to this blog. I hope I do not mess it up. I make this all the time, love it!! We saw that you had a bread recipe a couple of weeks ago, I forgot to save it..
Could you send it again please. Going to try you cornbread as soon as I get the buttermilk .thank you. Adding sugar and corn ruins good and easy cornbread. At least Southern Style cornbread. 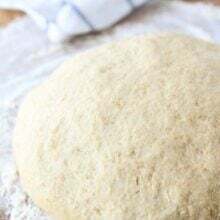 If you use self rising corn mean the baking powder and baking soda or useless also. Plain flour is great. Eggs and buttermilk along with the oil are perfect. But you need to heat said oil until very hot then pour into cornmeal/flour/buttermilk/egg mixture. Cook about 30 mins on 400 and you have perfect cornbread. Also cook in an iron skillet to get beautiful bread. Can’t be beat. That’s how we do it in the south and mine is loved by everyone. My Mom is from the South and a cornbread snob. She won’t eat it if it has sugar in it and prefers to put batter in a cast iron skillet and get the oil hot on top of the stove. Add batter and pop it in the oven. I love it but I guess I’m a cornbread whore- I’ll eat it made any way. My Dad loved Jiffy cornbread and would make it for me when I came home from school for lunch. I tried it recently and it doesn’t taste the same. I made home made crackling cornbread and it was delicious but finding cracklings are hard. I’ve made what we call Mexican Cornbread with jalapeno’s and corn in it. Mom wasn’t crazy about it but I liked it. She also loves it plain because she will break it up in a bowl, add sugar and milk to it and eat it for cereal. I think I’d love your version too but I’m kind of easy to please. This is so easy to make. I will never buy boxed cornbread again!!! My family loves it and so do my friends!! Can I use canned corn kernels rather than frozen corn? Any adjustments you’d suggest if doing so? Made this for a Thanksgiving Side Dishes class Im teaching tomorrow….Southern Cornbread Sausage Stuffing is on the menu and I wanted a Cornbread that wasn’t overly moist or too too sweet (though Ilove it sweet !). I decreased the sugar and substituted sour cream for part of the milk because I didn’t have buttermilk. It’s perfect ~ thank you !! Can you use regular whole milk if you don’t have buttermilk? I don’t like dry cornbread. Would you say this cornbread comes out moist & buttery? Thank you.